The Cape Floral Kingdom might be the smallest of the world’s six plant kingdoms but it is also the most diverse, with the 8,600 species it contains surpassing even the bounty of the Amazon Rain Forest. Proteas are the golden children of this super fynbos family, loved for being hardy and waterwise as well as irresistible to sunbirds. The incredible colour and sculptural form they produce season after season also makes them a hot favourite with Capetonian gardeners far and wide. Here are Stodels’ top tips for growing leucadendrons (cone bushes), leucospermums (pin cushions) and proteas in your garden. 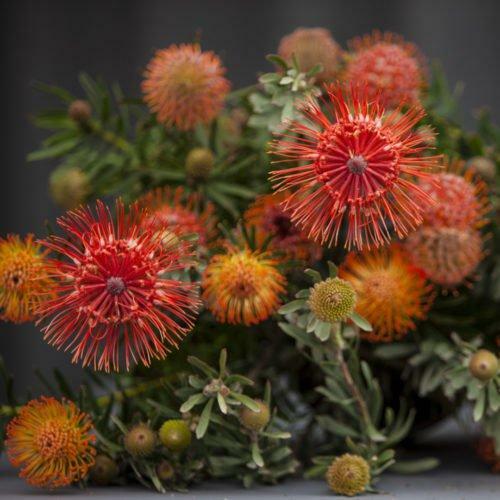 Most proteas are indigenous to the Western Cape so will feel at home in sandy, nutrient-poor soils (however it’s a good idea to add a small amount of peat when planting.) Also, do not use concentrated fertilisers; rather apply organic mulches that will prevent drying out and keep their shallow root system cool, as well as breaking down slowly and feed the plant the natural way. Proteas need to be planted in a sunny, north-facing spot in your garden and remember that good air circulation is a must so give your young plants enough room to grow when planting. Lastly, remember that during the first three years of growth, young plants will need to be watered well. Once established, you can happily ignore them unless we hit a dry spell. Soggy soil is a no-no so analyse your garden and choose the sunniest spot you can find. Figure out if the soil drains well here too. Dig a hole three times as wide and twice as deep as the nursery bag in which you bought your protea plant. Mix in plenty of protea potting soil or acidic compost. Skip the fertiliser. Carefully remove the protea from the packaging. They don’t like their roots being disturbed so handle the root ball with care. Plant the protea in the prepared hole, at the same depth as it was in the packaging. Pat the soil down firmly. Water your protea well and mulch the surrounding soil with organic mulches like pine needles, bark chips or wood chips. Once well-established, proteas should be pruned annually. Use sharp secateurs and cut all branches back to about 10cm from the main stem. Pull all weeds by hand. Also avoid digging around the roots as they are super sensitive.